Home / STORE / Nisse / Snowy Nisse Family. 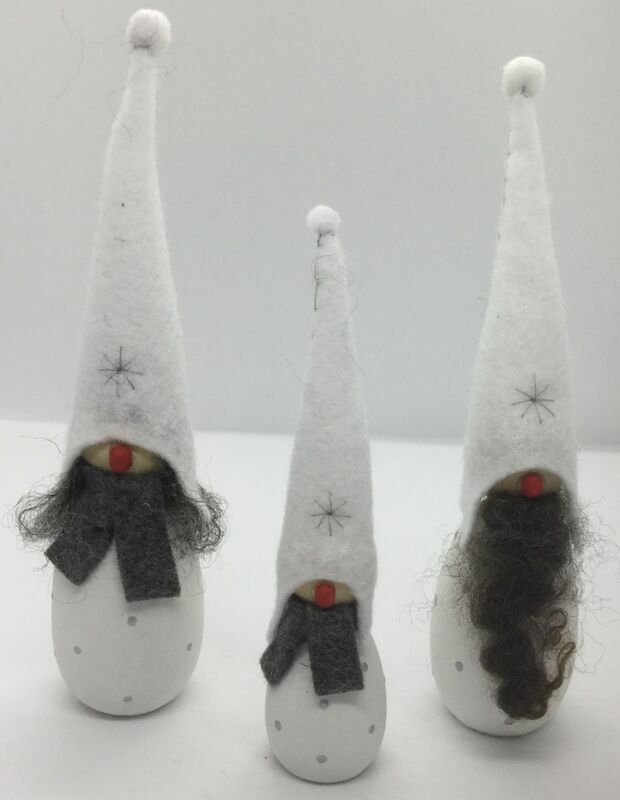 These wintry looking Nisse have white, silver spotted outfits. They have white felt hats decorated with a silver hand stitched star and a white pom pom on the top. This is a clever Winter disguise so they can look after the animals through the snowy weather. The Lady stands approx 17cm tall and has grey lambswool hair, keeping her warm is a grey knitted scarf. Hair colour may vary slightly. The Male stands approx 17cm tall and has an impressive grey lambswool beard to keep him cosy. Beard colour may vary slightly. The child has a grey knitted scarf to keep him warm in the snow, standing approx 13cm tall.